Recently, I posted audio of Gospel for Asia founder and CEO K.P. Yohannan promising staff that GFA would not take out a loan in order to build the new Wills Point, TX headquarters and living compound. Eventually, Believers’ Church in India (K.P. Yohannan was managing trustee at the time and he is also the Metropolitan Bishop and spiritual leader of the church) gave GFA in the U.S. $19.8 million toward the project. The church had to borrow money to make this donation. Furthermore, I asserted that an $11.5 million loan was taken in 2014 with the money used for the project. Today, I post evidence for the 2014 loan. 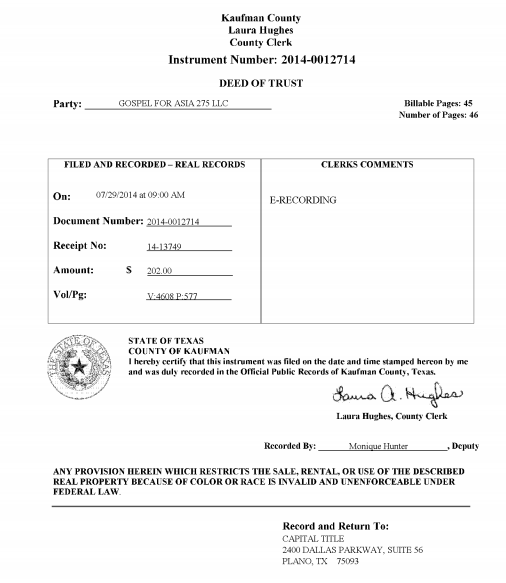 Below are images from the 46 page Deed of Trust. The agreement was based on the use of Generally Accepted Accounting Principles (GAAP) and pledges that all material statements are correct. This pledge may be in conflict with the audited financial statement for 2013 which failed to disclose that GFA made related party transactions to Believers’ Church, Love India Ministry and Last Hour Ministry. Furthermore, the bank (City Bank) was not informed that $19.8 million toward the building project came from a loan taken in India by a related party (Believers’ Church). Speaking as a non-accountant, this seems to be a significant and material omission. City Bank did not know that an entity related to GFA had taken a loan in order to provide GFA with funds. If City Bank took the audit at face value, they would have considered that $19.8 million to be a gift with no relationship to GFA anywhere in the world. City Bank might have reconsidered if they knew that an affiliate of GFA (and recipient of millions in U.S. donations) had to take a loan in order to keep the construction project going. The Bland Garvey 12/31/13 audit was completed in June 2014 and the Deed of Trust signed in July 2014. It is difficult, if not impossible, to imagine City Bank, an FDIC-regulated institution, making a $11.5 million loan in July 2014 without relying on the Bland Garvey audit report on the 12/31/13 GFA financial statements. That audit report included the misinformation on the source and nature of the $19.8 million previously raised and spent on the project. Next Next post: David Barton's Biblical Constitution – Happy Constitution Day!